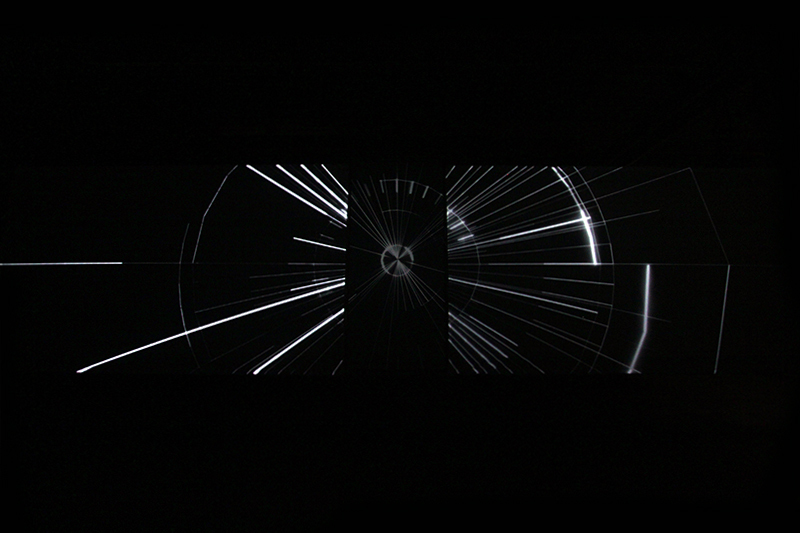 Parallels is a brand new audio visual installation by Takami Nakamoto and Noemi Schipfer, commissioned by STRP. After their overwhelming presence during Glow Next in November, they are happy to return to Eindhoven. Like in all their installations Parallels explores light as a material, but this time the space as a whole becomes their screen. The boundaries and notion of space, become abstract as the audience crosses the room, but in doing so, the audience also affects the space by breaking the light. This installation is strongly connected to the space in which it takes place; it lives within it. But as soon as the light hits the walls that define the space it reaches its limits and stops reproducing itself. Destructive Observation Field (D.O.F.) consists of a bright, multi-colour laser beam aimed at a sheet of black Perspex hanging in the air. Most of the light is absorbed and turned into heat, which slowly melts the Perspex. Only a small part of the light is reflected to a projection screen. As the heat slowly deforms the Perspex, complex, semi-organic reflections appear. The same ray of light that allows one to observe these beautiful spatial decompositions, also destroys them. There is no strict separation between 'writing' the deformation of the Perspex sheet or 'reading' the landscape – the scrutiny is destructive. The visible and aesthetic shapes of the reflected laser at first become more and more detailed, complex and fragmented. But after a certain amount of time, the laser beam not only destroys the Perspex, but also its own reflection. The light blinds itself.